MONTGOMERY, Ala. (AP) — Alabama’s offense can still try to play the neighborhood bully at times, just not quite so effectively as in recent seasons. Tua Tagovailoa and the top-ranked Crimson Tide’s offense were not as high-flying as they had been when they ran up against two of the Southeastern Conference’s top defenses. But ‘Bama has proven it can still overpower with force even if the running game hasn’t been nearly as dominant this season. The Crimson Tide, which hosts The Citadel on Saturday, turned to the running game early and late against No. 25 Mississippi State to build and hold onto a lead. It used to be a foregone conclusion that defenses would load up against ‘Bama’s ground game. There’s no doubt Alabama’s offense is more diverse this season, but the tailbacks have heard the criticism about a running game that’s been the offensive staple under coach Nick Saban. The Tide hasn’t really run the ball much less than last season. The yards just aren’t coming in quite such big chunks. Even without a dangerous runner like Jalen Hurts at quarterback, Alabama has only run 37 fewer times than through the first 10 games last season. But the Tide produced 33 touchdowns and averaged 6.0 yards per carry during that span a year ago, compared to 25 touchdowns and 5.2 ypc in 2018. 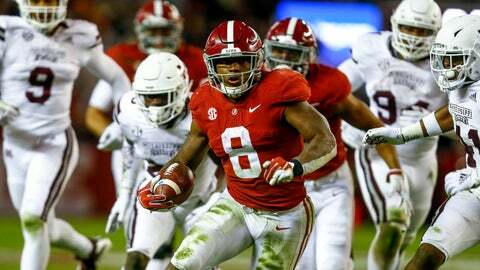 Alabama still has a typically talented backfield : The veteran Damien Harris, the versatile Josh Jacobs and the defender hurdling highlight-reel runner Najee Harris. Only Jacobs was anything less than a five-star recruit. But Alabama opened against Mississippi State with two run-heavy touchdown drives, totaling 16 rushes and just six passes. The Tide closed with 10 straight runs, the first six from Jacobs and the last four from Damien Harris. Like Williams, Jacobs relishes those kind of drives. Damien Harris is trying to become the first Alabama player to rush for 1,000 yards in three seasons, but ranks 14th in the Southeastern Conference with a modest 595 yards. Najee Harris has run for 588 and Jacobs has 381 yards and nine touchdowns while also returning kicks. Jacobs insists he doesn’t mind that much of the attention has gone to Tagovailoa and the receivers.